For top-notch cardistry, professional video and great accents, you can't beat Australia's "Joker & the Thief." The reviews were conducted by independent reviewers. We didn't pay for the reviews, and only supplied two decks of cards to each and ask that they open them, use them, and give their honest opinions. The reviews were done in 2012, before the formation of our company and the launch of this website. "These Key West chips do a great job with color combos and an insert that is simple, good looking and very much what you expect to see at any top-of-the-line casino... The mold design on these is a classic, having been used by the majority of Vegas casino's in the 50's. Not a bad thing. In fact, scary cool in my book... In the end, you've got great color combos, with a classic mold and well designed insert." 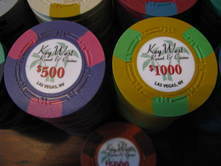 Want to write a review of Key West chips, playing cards or gaming items? Contact us. You can do a video or written review of one of our products. We'll publish it here, and in the "forum" section.